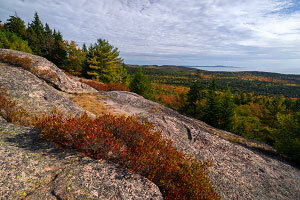 Day Mountain and The Triad are two relatively minor peaks located east of Seal Harbor. 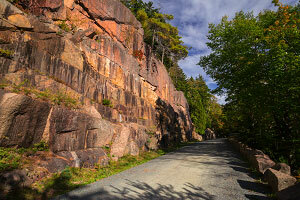 Day Mountain has the distinction of being the only peak that also has a carriage road that leads to the summit. Located directly north of Day Mountain, The Triad is a mountain that actually has three distinct peaks, and several trail options lead to each high point. Although both mountains are perhaps off of the casual tourist's radar, these peaks have relatively easy access and a hike linking the two offers great views and fun hiking through some classic Acadia scenery. Bring a map as the plethora of trail intersections and carrige roads can be a bit confusing to navigate. Rating: Moderately strenuous day hike. Access: Day Mountain Trailhead along Route 9 east of Seal Harbor. Elevation Change: 320-ft elevation gain up Day Mountain; 340-ft elevation gain up The Triad. The Day Mountain parking area is located just outside of Acadia National Park, along the southern loop of Route 3 roughly .8 miles east of the town of Seal Harbor. Park in the small lot and then cross the road to the north to find the Day Mountain trailhead marker. (This parking area is also the start for the Lower Day Mountain/Hunters Cliff Trail to the south.) The Day Mountain Trail heads north through the pleasant forested landscape and soon enough it enters the park proper and intersects with one of the carriage roads. Day Mountain is the only peak in Acadia that has a carriage road that goes all the way to the summit, but the road takes many loops and switchbacks compared to the more direct trail. Follow the carriage road pointed to "Day Mountain Summit" for a few moments and then look for the Day Mountain Trail again as it leaves the road to the northwest. As the trail heads up Day Mountain, the scenery starts to get more interesting as the mountain gets steeper with more sections of exposed granite allowing for better views. The trail crosses over the carriage road three more times before reaching the summit marker. While the summit isn't as stunning as some of the larger peaks in Acadia, the views are still great and there are plenty of great spots to just sit and relax. For a short family-friendly hike, you can turn around at this point, but those looking for a longer hike can continue down the north face of Day Mountain where the trail joins up with the carriage road again as it crosses a beautiful stone bridge over the Park Loop Road. One suggestion for exploring The Triad is to continue north along the Triad Trail as it crosses the Hunters Brook Trail and passes the Middle Triad. At the northern base of the mountain, take the Bubble & Jordan Ponds Path southwest to loop around the western base of the mountain. Then take the Hunters Brook Trail east back up The Triad to get some good views from the Middle Triad. When you hit the junction with the Triad Trail (where you have already been), turn around and then head south on the Hunters Brook Trail to tag the West Triad which is probably the best of the three peaks, with its steep granite dome offering great views of Seal Harbor in the distance. The trail descends the mountain and ends at the carriage road. Hike the carriage roads back to the parking area. For those looking for a longer and more strenuous day, a hike up Day Mountain, The Triad, and then Pemetic Mountain makes for a great 6-8 hour adventure. Pemetic Mountain is a stunning peak with incredible views. 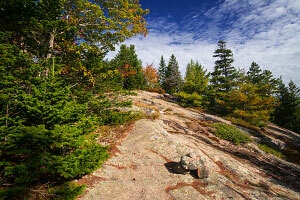 If you want to hike The Triad without Day Mountain, a good starting point is the Jordan Pond parking area. Hike the Bubble & Jordan Ponds Path east to the base of The Triad. Day Mountain and The Triad might not be the most stunning peaks for casual tourists, but this is a great hike for those looking to explore. The West Triad is a great spot that isn't visited by many people. 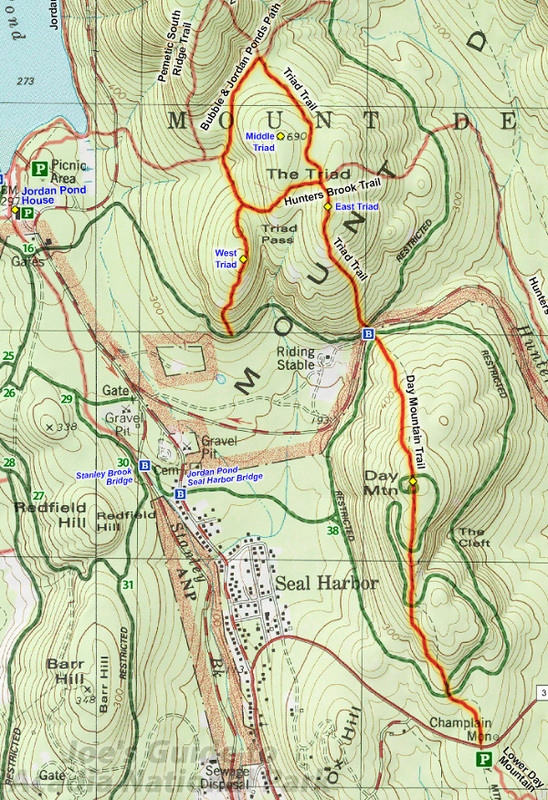 Bring a map as the plethora of trail intersections and carriage roads can be a bit confusing to navigate.